The Young Farmer Challenge originated in the eastern states of Australia as an initiative of the RAS Youth Group and was officially launched at the Sydney Royal Easter Show in 2009. The South Australian Next Generation Group has taken on the YFC concept and is looking to drive the challenge to Country Shows state-wide with aspirations to hold a state final at the Royal Adelaide Show. The Young Farmers Challenge with support of the Next Generation Group first made an appearance at the 2016 Gawler Show and has grown from there. The competition is open to teams which must have at least one representation from each gender. The Young Framers Challenge is a great way for Australian’s to network and engage with other people and industry leaders from across the region. Supported by the Next Generation Group it is designed to promote farming and showcase agriculture. This year the Gawler Show is hosting two sections this year The Young Farmers Challenge aimed at high school students aged between 13-17 and the Young Farmers Challenge aimed at people 18 years and older. Teams will compete in a variety of agricultural based challenges such as rolling a bale of hay, decorating a cake, rolling up a swag, putting up a temporary fence, building a scarecrow and sculling milk (Please note that this is not the final list of challenges and they will vary each year). Don’t let this put you of whilst these challenges have a focus on agriculture and farming, there is no prerequisite to be involved in farming and anyone from the public is encouraged to enter. Saturday 25th of August 2018, Gawler Show Grounds. Both of this year’s events will feature in our Pre-fireworks Show which commences at 5:30pm. The events will start at approximately 6:15pm. You will not only have the opportunity to represent your community and network with other likeminded people, but you will also get to compete for your chance to win from a large prize pool kindly donated by sponsors and the show. Prizes will vary each year but trust me when I say it is worth it. All competitors will also gain free entry into the show. 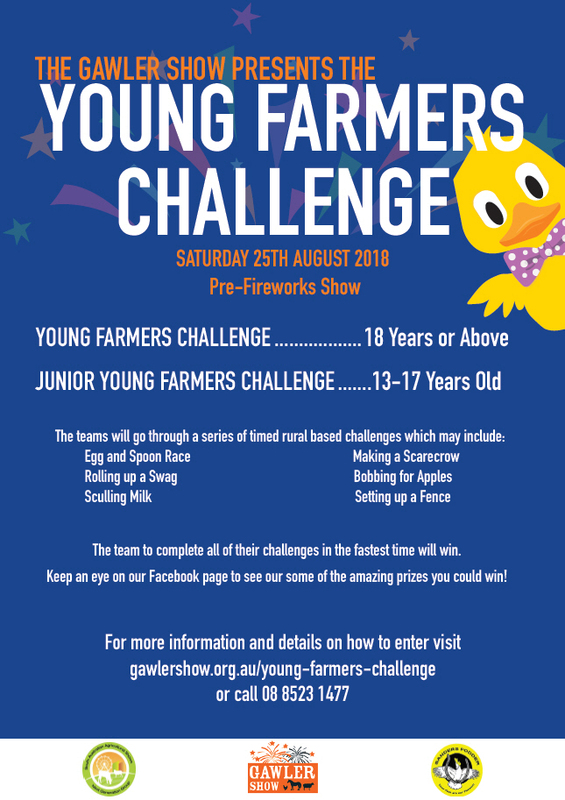 For the Junior Young Farmers Challenge one supervising person over the age of 18 will also gain entry. Most importantly you will have a lot of Fun! Each team must include both male and female competitors. All female or all male teams are not eligible to enter. Please contact the show office either via phone (08) 8523 1477, via Facebook or email entertainment@gawlershow.org.au to register your team. The maximum number of teams is four per competition so get in fast to secure your place! Entries close on the 17th of August. All competitors will be competing at their own risk and must undertake all activities in a safe manner. All competitors must wear a shirt with sleeves (provided), long pants and closed toe shoes. Participants will need to keep in mind that they may be photographed, and these photographs may be used on social media, local newspapers and websites by the Gawler A, H & F Society. Competitors must be available in the afternoon of Saturday the 25th of August 2018 for a mandatory safety briefing and be at the designated meeting place 30 minutes prior to the evening event. Each year we are on the lookout for companies/people who can provide sponsorship either in the way of prizes to add to the prize pool for competitors or in terms of equipment for challenges. If it is in the way of equipment for challenges, we can name the particular challenge after your company. An example of some of the equipment we generally use are haybales, farming equipment (portable or electric fencing, machinery, etc.) and fresh produce. However, we are happy to discuss the possibilities of your product and tailor a challenge to suit you. The event is scheduled during our prime-time Pre-Fireworks Show and sponsors will not only have their logos displayed but they will also be mentioned by the host with a blurb about the business and support of the Young Farmers Challenge. In the lead up to the event, sponsors have the opportunity to be promoted through the Galwer Shows social media events and media campaigns and if timing allows they will feature in the Gawler Show Book. The Gawler Show is the largest country show in the state and the second biggest show in South Australia, behind the Royal Adelaide Show. The Gawler Show has an attendance of over 30,000 people each year and we are looking for local support as we continue to showcase the best of the Gawler region and promote agriculture in South Australia. For more information please contact the Gawler Show Office on (08) 8523 1477, via the website or email entertainment@gawlershow.org.au to find out how you can be involved.